The stencil I used is the "Marrakech" from Cuttingedgestencils.com. The paint is from turtlefeathers.net and is called angelus paint. It is made especially for painting leather (it has a bit of give to it and won't crack). The colors I choose were "light grey" and "mustard", and finally I finished off the chairs with a coat of their Acrylic Finisher (in Satin). Before stenciling the chairs I lightly sanded them with a fine sandpaper to give the paint something to grip to. Since the chairs came unassembled I decided to leave them that way to make it a little easier to stencil. The chairs worked well for stenciling since they have a very basic shape (not a whole lot of curves or crevices to try to stencil). I was amazed at how easy the process was - total time was only about 4 hours. Once they were done and had dried for a full day I assembled them. For the stencil I decided to use a small stencil sponge brush (called a "spouncer" - you can find them at Michael's) rather than a foam roller. I just wanted to go a little slower and more carefully and I was glad I did. The paint is water based so it was easy to tidy up any smudged lines once the stencil was removed and while the paint was still a little wet. Because I used two different colors I taped off the areas of the large stencil that would be the mustard color. After I stenciled all the chairs in grey, I went back with a small single stencil (it comes free with the large stencil) and painted in the small "mustard" areas. To hold the stencil in place on the chair I simply put two big pieces of rolled up tape on the center of the back of the stencil then stuck it to the chair. If I didn't already have a full-time job of mother I would consider being a custom leather furniture painter! Just kidding - but really somebody could make a living doing this! There are endless possibilities since there are tons of stencil designs these days and lots of different colors of leather paint. If you are a real artist you could free hand a design. If you didn't want to purchase a stencil you could print something off the computer and trace it then paint by hand. (I didn't trust my skills to freehand anything). 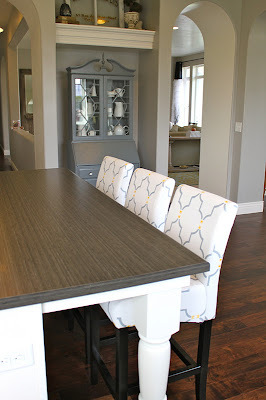 I loved that I could pick out the exact style and colors I wanted for these chairs - a custom chair at a very cheap price! I spent $40 on the stencil and another $40 on the paints. For the paints I bought a 4oz bottle of the mustard color, a 4 oz bottle of neutral color (which I didn't end up needing), a pint of the light grey, and a pint of the acrylic finisher (in matte) - by the way the website recommends a preparer-deglazer but it is only to be used on leather -not manmade stuff - and my chairs are made of "leatherette" whatever that means so I didn't use the preparer-deglazer on it). I overbought on the paint (but I figured it was better to be safe than sorry). The particular stencil I chose really didn't require a whole lot of paint. I probably could have gotten away with just a 1 oz. bottle of mustard and 2 4oz. bottles of light grey. Click here to see my unhappy thoughts on the "Acrylic Finisher." 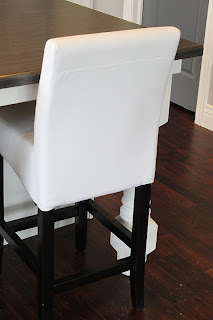 So I bought the chairs 2 for $152 from overstock (however I DON'T recommend them - click here to see why) then add in the $80 in materials and my total cost is $384 for four barstools or $96 each!!!!!! To have these stools custom upholstered in a fabric of my choice would have cost a lot more than that and they would have been ruined so quickly. I am hoping this painted leather alternative means they will stand the test of time and 3 boys! Here is the Before and After of my kitchen. I honestly have never had so much fun making something. It really was easy and I enjoyed every minute of it. I am seriously considering making a set painted in a red design for Christmas time. If anyone reads this and is inspired to make their own please, please, please send me a picture! I am so excited about the possibilities that I would love to see some of them come to life. And don't hesitate to ask me any questions you may have. I now think every kitchen and dining room should have some custom painted leather dining chairs! It's worry free custom dining! I have painted more chairs! Click HERE to see all my Leather Chair Posts. I LOVE THAT!! Great job! I just found your blog from 4 Men 1 Lady. You did such an amazing job!!!! I'm excited to check out your other posts. Saw you over at 4 Men...absolutely love your barstools...GORGEOUS!! I am in awe of your talent. I found your blog from 4Men 1Lady. Beautiful! The stools didn't turn out looking like a DIY at all! Great job! They look amazing! I painted a leather ottoman, but I made my own paint mix. Who knew you could buy leather paint? I popped over from Michele's blog. I'm glad I did, your blog is great. These are AWESOME! Love cutting edge stencils... what a great idea. Beautiful job, Amy!!! your kitchen is gorgeous too!! visiting from, 4 Men 1 Lady. Coming over from my Michelle at 4M1L. I love a GOOD transformation. Just popped over from EmilyClark. What a great idea! Your bar stools turned out so good. They really add that "something" to the kitchen. I saw this on Emily Clark's blog and it looks great! Nice work! I love how the gray in the design ties to your gray accents in the kitchen. Fabulous! Just found your blog from Emily A Clark. Great work! Your kitchen is haute! Wow! You're a maverick in the world of leather painting! Way to be a trend-setter. I love the risk you took. It turned out amazing! It is hard to believe that one fabulous idea has TOTALLY transformed your entire kitchen! Your kitchen was already beautiful but the addition of your DIY stools has really put it over the edge. LOVE it! I just love creative people! You did an awesome job. The chairs are beautiful. Your kitchen is beautiful! I'm loving the gray paint on your walls. Could you pass along the color and brand? Thanks! Saw this on Emily Clark. Amazing transformation. Those chairs are stunning and so is the rest of your kitchen. Great job! To answer a couple questions - the color on the kitchen walls is Benjamin Moore's "Ozark Shadows" and my countertops are not honed stone - they are cheap laminate! Maybe someday we'll get some stone in there. The countertops are Wilsonart Laminate, Eastern Accents color "asian night." A lot of the information about my house can be found on my Casablanca "Before" Tour tab at the top of my blog. Thanks for all the kind comments! Saw this on Emily A Clark's website, and just had to tell you how beautiful your kitchen is! Those barstools look gorgeous and add so much to the room. Fantastic job!! Coming over from Emily Clark's blog. I love the final result -- so chic and the perfect amount of pattern for the kitchen. BRAVO!!! SIMPLY AMAZING!! Great job. Can't wait to see more from you!! To Kelly in Wisconsin - Yes there is a clear acrylic coat applied after the paint to protect it. You can buy that from Turtlefeathers.net along with the paint. I bought a pint, which was more than I needed but I figure I can put another coat of acrylic finisher on each year just to make sure the paint stays protected. I am fairly confident that there won't ever be a problem with the paint coming off. As I was working with the stencil and cleaning up smudges I quickly found out that there was no cleaning up spots even just 5 minutes after it had dried - that paint was not going to come off! I also figure if it ever does need a touch up, I own the stencil and the paint so that should be fairly easy to do. Let me know if you have any other questions and good luck! absolutely STUNNING results! Seriously, I couldn't be more in love with this makeover! Nicely done!!!! I am in LOVE! These look fantastic! The pattern you chose reminds me of a super expensive fabric I pinned awhile back, so gorgeous! I think you did an awesome job, in design and in execution. Doesn't hurt that your kitchen is dreamy, either! WOW! That is amazing! I too was about to buy bar stools from overstock, but now I may have to change colors and find a fun stencil. I love this! We are building a house and our new kitchen looks very much like your-it's great to see what fun bar stools would look like in the space. Thanks for sharing! Hope that helps any of you that are wanting to try this! They turned out beautifully and really add to the kitchen's design....Now excuse me while I peek around your blog! AH-MAZING!!!! I am in love with your kitchen and what an incredible idea!!! I absolutely love this blog. I have added you to my blog roll and linked in an article. I've nominated your blog for an award. Congrats! Just click link. 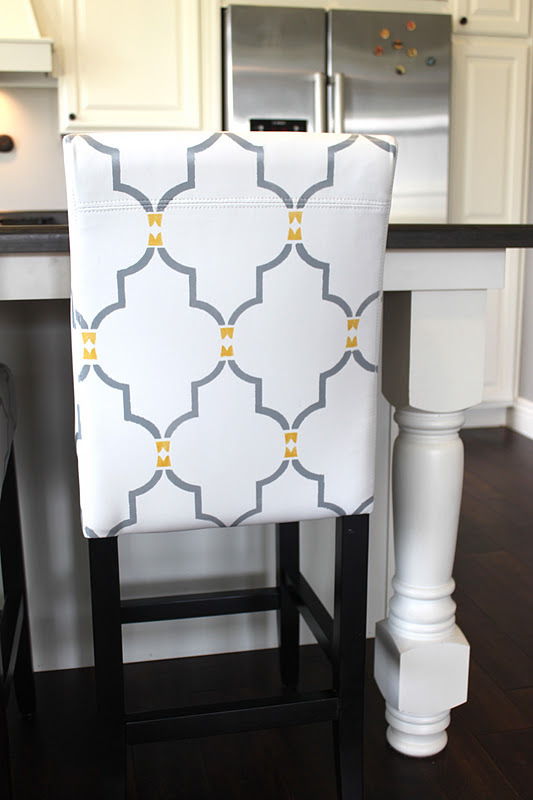 Can you pls tell me more about how to attach the stencil so firmly to the chair surface ？ I recently did a stencil project and the most difficult part is to attach stencil firmly and easily to the surface. what tape you used for it? 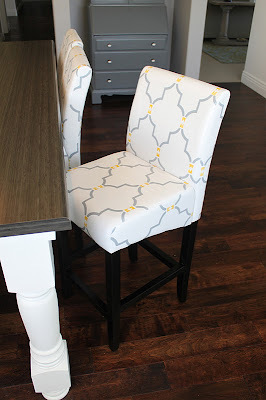 stencil has shapes, so how can you attach all the lines firmly to the chair surface? thank you very much. The stencil is not attached "firmly" to the chairs- nor does it need to be. The chair was unassembled so it was laying down when I stenciled it and I just used a couple pieces of painters tape to hold it in place. Having a stencil "firmly" in place does not guarantee that the paint won't bleed or that your paint lines will be exact- that is dependent on how much paint you use. Use a very small amount of paint and your paint lines should turn out great (even without a "firmly attached" stencil)! Hope that puts you at ease. Hi, Emily Clark sent me and these chairs are absolutely gorgeous! I have some like them but they are dark, dark brown and I was going to make slipcovers. I want big, bold cream and brown stripes. But mine are faux leather and I think this paint only works on the real stuff. Do you know if that is true? Thanks so much! I think the paint will work on faux leather but to be sure you should check out the turtlefeathers.net website. There will be an email address there as well so that you can email them any questions you may have - they know their products better than I do! Good luck and I would love to see pictures of the final product! The chairs look great! I'm most impressed at how the pattern lines up on the sides. I'm not sure I'd have the patience to do 4. Bravo! You're amazing. Such a talent! I am floored by how amazing this is. I am not sure I would be as brave as you! Even though you say it's easy, it looks really daunting! Every time I paint a stencil, it bleeds! Also, how did you get the stencil to wrap perfectly around the chairs? It's amazing! I choose a stencil that I knew would be easy - it also made it easy to wrap around the top of the chair. The stencils from Cutting Edge are pretty big which allowed me to wrap just a little bit around the top part of the chair then once that was dry I flipped the chair over and lined the stencil up with the small part at the top I had already painted and just continued down the chair. Use a very small amount of paint and that should help the "bleeding." Oh my goodness! These are amazing! I spent way too much time peeking around your blog this morning but am so inspired! You have such a beautiful home. I am in love with all of your moldings and trim work. I just want to bring some coffee over and hang out in your kitchen for a little while. Looking forward to seeing more! Oohlala! Now that's a transformation great idea and a beautiful kitchen. 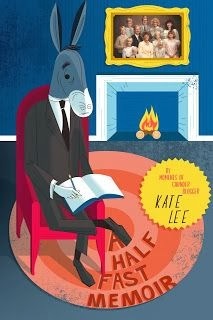 I'm drooling over the great secretary that in your nook/niche. Visiting from Living Savvy. That is a heavenly kitchen. the chairs complete it perfectly! These are amazing! I can't believe they are diy, the quality is fantastic! WOW! Those chairs look amazing! Beautiful work and I can't wait to check out your blog some more! these look so cool! I had no idea you could paint leather! Love these! Your kitchen's beautiful! Those bar stools are amazing! What!!!!!!!!! These are fantastic. I am in love. Will be posting these on my facebook page soon! You are so talented. How freakin cool is that??!! Nice job! Love this! I hope you don’t mind that I included a photo and link in a post I did on stencils. 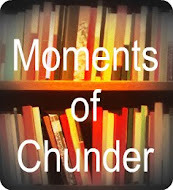 (I’m new to blogging and unfamiliar with linking etiquette). Thanks for the inspiration!